I get products sent to me daily to try out. I unfortunately don’t have time to do a post for each item that I get to review. So I want to make sure these items get seen and learned about. The only other solution I could see to do is to do a April’s Health and Wellness Product Roundup 2017 on the products I like and want my readers to know about. I hope you enjoy these as much as I and my other reviewers did. Ceramides is a nutricosmetic solution scientifically formulated for healthy skin hydration. This unique blend of beauty-enhancing nutrients promotes skin hydration, elasticity and cellular turnover for glowing, supple skin. The star ingredient of this formula is rapid action ceramides. Ceramides are plant-based lipids clinically shown to increase moisture and elasticity in just 15 days. Additional beauty-enhancing ingredients like hyaluronic acid, pine bark, astaxanthin, lutein and coconut water make this the ultimate skin hydration supplement. Super Ceramides works synergistically with NeoCell’s Super Collagen C formula. As with all NeoCell products, Super Ceramides is both non-GMO and gluten free. Active Ingredient | Purpose Allium Cepa 6X HPUS | hay fever, watery eyes Natrum Muriaticum 6X HPUS | sneezing, itchy eyes Histaminum Hydrochloricum 12X HPUS | sinus pain Luffa Operculata 12X HPUS | sinus pain, headache Galphimia Glauca 12x HPUS: sneezing, runny nose Nux Vomica 6X HPUS | itchy nose and throat �HPUS� indicates the active ingredients are in the official Homeopathic Pharmacopoeia of the United States. Inactive Ingredient: Lactose N.F. Warnings As with any drug, ask a doctor before use if pregnant or nursing. Consult a physician if symptoms persist for more than 7 days or worsen. Keep out of the reach of children. * SUPPORTS SKIN HEALTH -Contains Proline & Glycine for healthy hair, skin and nails. Reduces wrinkles & cellulite. Improves elasticity and promotes tissue repair. * EASY TO DIGEST – Perfect to blend into coffee, tea, smoothies, stews, sauces and broth. Flavorless and odor-less that will not cover up the taste of what you are trying to enjoy. Who doesn’t love the sun? The sun is very important to all life forms for survival. We cannot live without the sun. It is in fact the center of the solar system. Those who live in cold climates always pray for the sight of the sun. As much as we all love the sun there are times that the sun can cause a bit of inconvenience. The sun rays can cause glare and makes it difficult for us to see especially the sun rays coming in through the windows of the car while we are at home or driving. While driving it is important to be able to see clearly despite the glare. Good thing that Window Sun Shade for car windows were invented. It is easy and convenient to use. You just attach the sunshade to the windows of your car. It can keep off the sunlight thus preventing glare and letting the driver navigate more safely and not squint his eyes. Aside from sun protection for the driver it is also for the passenger and can keep them comfortable especially during hot days. It can keep the temperature inside the car down so you don’t need to turn up your air-conditioning system when the sun is hot. * KEEP A TRACK OF YOUR HEART RATE: Our updated service is going to blow your minds off-. Now you can check your heart rate at anytime! Keep track of every single movement while exercising – a small yet mighty device, with many functions- which improve your life just like that! * CHECK YOUR CALLS & MESSAGES ON THE GO: If you have a passion for fitness activities such as running, jogging or walking, or you’re busy with work and you’d like to check your missed calls or messages while on the go, then this feature-rich wristband is exactly what you need. Never miss a call again! You also have the option to configure alerts and notifications for your social apps – what more do you need? * ULTIMATE HEALTH TRACKER: Create your own personal fitness diary with ease thanks to our steps, calories and sleep tracker, you keep a full analysis of your everyday progress. With the sleeping tracking function you’ll have a detailed report of your deep sleep, light sleep, REM and awake time. Track your walking and running paths with the mobile app-based GPS tracker. Optimize your workout schedule, have your health status and detailed charts with you anytime, making your life better instantly. * WIRELESS CONNECTION: Our Bluetooth connectivity ensures all of your devices are connected without extra effort and hassle. Using our intuitive health app on both iOS and Android, you’ll be able to review day-by-day progress, centrally view all activity and share all your data across devices, as well as sync to Apple Health or Google Fit. * BUILT TO LAST: No matter how many hours you spend out of home, this exercise band is was built to serve even during vigorous activities. Thanks to its long-lasting battery, sweat, rain and splash proof, your Q-band is guaranteed to stay by your side for a lifetime. * BEST CELLULITE REMOVER: Our anti cellulite gel is considered to be the BEST choice because it glides on smooth smoothly, it dries quickly and the golden formula instantly blurs imperfections. * NATURAL INGREDIENTS: The formula features an organic fusion of supreme ingredients, making it much more effective than other natural body firming lotions. * GENTLE FIRMING FORMULA: This golden anti cellulite gel by Jaowying Beauty is gentle enough for ALL skin types, even those with sensitive skin. It’s not a “hot” gel or a “cool” gel, so it does not cause any discomfort or irritation. * FAST TIGHTENING RESULTS: The golden gel immediately diffuses stretch marks, blurs cellulite and disguises saggy patches, while the ingredients gradually tighten, smooth and firm the skin. * SAFE & AFFORDABLE: Unlike other cellulite removal creams, our firming body gel is a safe and affordable alternative to going under the knife. The anti cellulite gel is commonly used on problem areas such as the inner or outer thighs, the abdomen, the chest, under the arms, etc. Dr. Gingers mouthwash & toothpaste combines the ancient and proven practice of oil pulling with modern, dentist-recommended ingredients to make Dr. Ginger’s effective, easy, and fun to use. Dr. Ginger’s Coconut Oil Mouthwash never solidifies or clogs your drain, and has a unique and tasty coconut-mint flavor. Just swish our mouthwash for 2 minutes for a healthier, happier smile. Lips are constantly in use and openly exposed to the environment so they are more subject to dehydration and aging. Our unique and natural moisturizing enhancement holds the key to full, soft and healthy looking lips. This lip-loving technology works by providing long lasting moisture while stimulating the molecular structure of lips’ thin skin membranes. Collagen and hyaluronic acid play an integral role in shaping, filling and defining the appearance of lips. Our complex blend of safe, irritant-free ingredients directly stimulates collagen and hyaluronic acid synthesis while restoring optimal moisturization when worn alone or under pigmented lip products. Smooth over lip area as often as needed. May be used under lipstick or alone. By calming our body and mind we bring a more peaceful presence to the world around us. Namaste. A blend of Epsom salt, organic olive oil, and our unique Yoga Soak essential oil blend (rose geranium, lavender, marjoram, orange and frankincense essential oils). This soak is especially calming and relaxing. 20 ounces – enough for 8 full baths. Our most popular formula- a great facial sunscreen with a cashmere matte finish. Apply it to the face, neck, chest and hands daily! Zinc oxide provides consistent and photo-stable protection against UVB and UVA rays. It’s soothing and calming to the skin, which is why mothers apply zinc oxide to their babies’ bottoms. This 15% zinc oxide and 7.5% encapsulated octinoxate blend applies invisibly and smoothly to the skin. It provides just the right amount of hydration for many but pairs nicely with our H20 Hydration. It is also perfect for those with combination, oily or acneic skin. This is an essential for both young and mature skin and provides essential daily protection. For those looking for a pure, physical sunscreen the Simply Zinc Sun Whip will change how you view zinc oxide based sunscreens. Simply Zinc Sun Whip contains 22% certified organic Zinc Oxide in a rich and hydrating olive base. It applies smoothly and invisibly while it absorbs quickly without leaving a shiny finish. It is perfect for those looking for more hydration or for those with sensitive skin. It is also a great facial sunscreen for women with melasma or hyperpigmentation, by providing strong and consistent protection against UVB and UVA rays. The anti-oxidants provided by the olive oil base and the inclusion of tetrapeptides also make this a great anti-aging sunscreen. Our all natural Pikake Body Wash will transport you to Paradise while gently cleansing and refreshing your skin. Our signature body wash combines gentle, biodegradable surfactants with skin soothing Hawaiian extracts of Green Papaya, Pineapple, Coconut and Banana, and Hawaiian Hydrosols of sugar cane, Olena( turmeric), ginger root, Aloe Vera and Mamaki leaf. Infused with moisturizing organic Coconut oil and Coconut milk, our body wash will leave your skin feeling clean and healthy. Plumeria is fresh and delicately sweet, mysterious and understated. Plumeria or Frangipani blossoms are commonly found throughout the islands and the tropical fragrance is well-known worldwide. Slip into the tropics with our individual bath rituals that are guaranteed to transport you to paradise! ✔ Relieve stress, exhaustion & relax your mind: Use a few drops of Lime Oil in your vaporizer or diffuser, or add it in your bathwater. Not only this will relax you, but it will boost your immune system. ✔ Natural No Chemicals Cleaning: Use your Lime Essential Oil in natural household cleaners, including sprays, scrubs, and furniture polish. Say no to chemicals, and yes to natural things. ✔ Fight off colds: Lime’s antiviral properties can help fight colds by diffusing, or massaging it into the body. Just add a few drops to a bowl of steaming water and inhale it or mix a few drops with a carrier oil, then rub it on your neck and chest. ✔ Promote healthy hair health: by mixing a few drops of lime oil in your favorite shampoo. Lime can help remove oil quickly while moisturizing your scalp from within. ✔ Natural deodorant: Just use one drop of lime essential oil with 2 drops of coconut oil, and apply under the arms. It does make a great deodorant, while avoiding chemicals. ✔ Skin Revitalizer: Lime essential oil makes a great addition to a beauty routine. Try mixing 1/4 teaspoon of baking soda, 1 tsp of coconut oil, 1 drop of lime essential oil, and any water necessary, and use as a face scrub to revitalize the skin. Being a blogger has blessed me in many ways and introduced me to a lot of wonderful people. To show my appreciation to the brands that choose to work with me and to my many followers I am going to giveaway a box full of new, unused and non expired items from the very brands I got to work with. Thank you for working with and following us! Here are some of the products that are in this months goodie box. 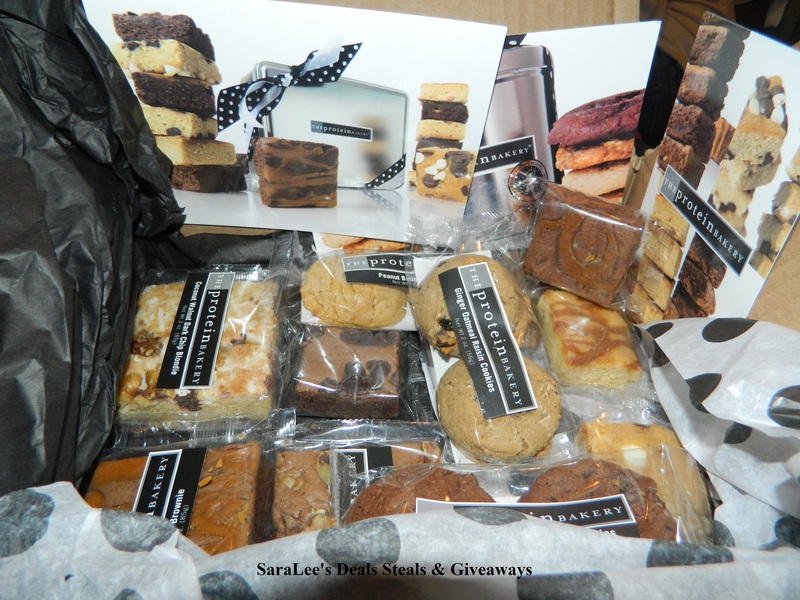 Now for the giveaway: One lucky person will win the December’s Goodie Box. This is open to US and ends 1/20/17 @ 11:59 pm est. To enter, Simply do the tasks on the Giveaway Tools widget below and you’re set to have a chance to win! Remember you can’t win if you don’t enter. It only takes one entry to win! So, we know the value of weights and measures. We chose the name Protein Bakery, for a good (and healthy) reason. Muscle-building protein is a huge component in all our delicious cookies, brownies, and blondies. Protein makes you feel fuller faster and prevents spikes in blood sugar levels. It's one way to keep the heart beat steady and the body in balance. Every delectable, guilt-free bite is high in dietary fiber, low in gluten, and delivers up to 5 times more protein than the average baked treat. Our trans-fat free, preservative free, and wheat flour-free recipes are also nutritionally balanced. We combine natural ingredients like heart-healthy rolled oats rolled oats, light brown sugar, and the finest chocolate. We bake small batches from scratch every day. With the same attention to perfection as we did on day 1 in November, 1999. Our 20-plus flavors of creative culinary confections boast gourmet accents like swirls of rich peanut butter, tangy cranberries, toasted walnuts, sun-sweetened coconut, and so much more. 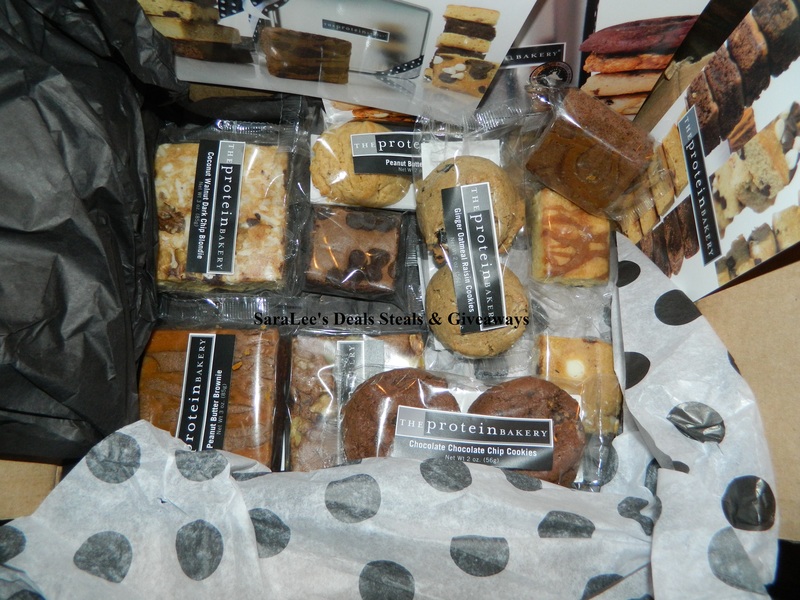 The sampler box I got from The Protein Bakery was packed full of goodies for every sweet tooth in my house. My husband works long hard days at his factory job and the Protein packed cookies, brownies, and blondies were a great treat to help my husband get through his days. Even my growing 14 year old son loved having one of the cookies, brownies or blondies as an after school snack. I love when I can give a treat to my family that they truly can benefit from. I even tried the Chocolate Chip Brownie and I must say it was so soft and delicious. My family enjoyed the Protein baked cookies, brownies and blondies. Disclaimer: I got the The Protein Bakery Sampler Box free to do this product review and was not paid for my response.